If you find the names confusing, you're forgiven. Changgyeonggung sits right next to Changdeokgung. They even have an adjoining entrance so you can proceed from one to the other. It may not be as spectacular, but the palace grounds are still worth the visit. 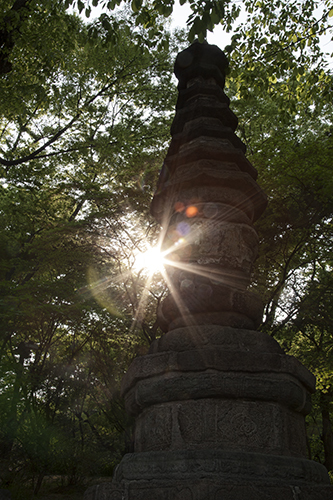 I found Changgyeonggung to be very peaceful and relaxing. You'll see people chilling around the lake or enjoying the tranquility inside one of the buildings. In all of the palaces I visited, the building below was the only one that you could actually go inside (minus the shoes, of course). You can find this 7-story pagoda by the lake toward the back. We also saw this sundial as we wandered the gardens. I tried, but I couldn't figure out how to read it. I enjoyed the fact that there were very few people at Changgyeonggung. We stayed until closing time and it sometimes felt like we had the place to ourselves. Because we used the rear entrance directly from Changdeokgung, this front entrance pathway leading to the main palace was the last thing we saw as we exited.